"In purchasing dietary supplements, I've learned to be careful of what I buy. Things are not always delivered as they are advertised. With Myristin®, you can be confident that you are getting the real cetyl myristoleate that I discovered and researched. EHP Products and its licensees are the only companies I allow to use my name in their marketing. I've checked EHP's cetyl myristoleate, and it is just like it should be." 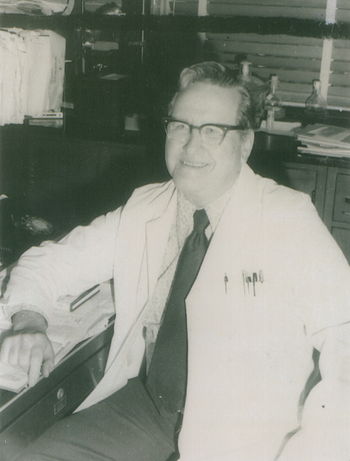 Harry W. Diehl was born in 1910 in Harrisonburg, VA. Considered by many as one of the most brilliant natural talents ever seen in chemistry, Diehl retired in 1974 after 40 years of service at the National Institutes of Health in the Laboratory of Chemistry of the National Institute of Arthritis, Metabolic, and Digestive Diseases. Diehl was led to the discovery of cetyl myristoleate by his concern in 1953 about a neighbor’s pain and disability. He began his experiments in 1962 and pursued a scientific investigation and exhaustive analyses, using laboratory mice and rats. By 1964, he had determined the substance he was looking for was indeed to be found in mice. Mr. Diehl later discovered that cetyl myristoleate also occurs naturally in male beavers and sperm whale oil. After countless experiments, reactions, and purifications, the immunity factor was identified, through gas chromatography and mass spectrophotometry, as cetyl myristoleate. As he put it, "My discovery of cetyl myristoleate was a lot of hard work and a lot of old fashioned chemical cooking." Diehl's research on cetyl myristoleate was published in the March, 1994 issue of the American Journal of Pharmaceutical Sciences, the prestigious peer reviewed journal of the American Pharmaceutical Association and the American Chemical Society. Diehl received two U. S. Patents on cetyl myristoleate, the first in 1977 and a second in 1996. An award winning researcher, Mr. Diehl developed over 500 new compounds, several of which were patented by the U.S. Patent Office for the National Institutes of Health. Diehl was recognized in 1958 for developing a new method of preparing 2-deoxy-d-ribose, a sugar found in deoxyribonucleic acid. This sugar is of vital importance to much basic research, and was used by Jonas Salk, M.D., as a culture medium to grow the Salk polio vaccine virus. Diehl’s process was published in Biochemical Preparations, one of the most authoritative journals on the subject. Harry Weldon Diehl died after a short illness in Charlottesville, Virginia on December 22, 1999 at the age of 89. In life, Harry Diehl was a tower of strength, dedication, and chemical knowledge. He left behind a legacy of hope.